"I had not noticed the likeness in the past because I had not paid particular attention to the pheasant's hairstyle." Regardless of where you stand on the policies of President-elect Donald Trump, there is one thing we can probably all agree on: Never before has a head of hair so unique graced the hallowed halls of the White House. But as iconic as Trump's wispy, yellow coif may be, he's actually not the first one to have adopted such a distinctive look - and people have started to notice. At China's Hangzhou Safari Park, a stylish Golden pheasant named Little Red is fast becoming an international celebrity for one reason alone. 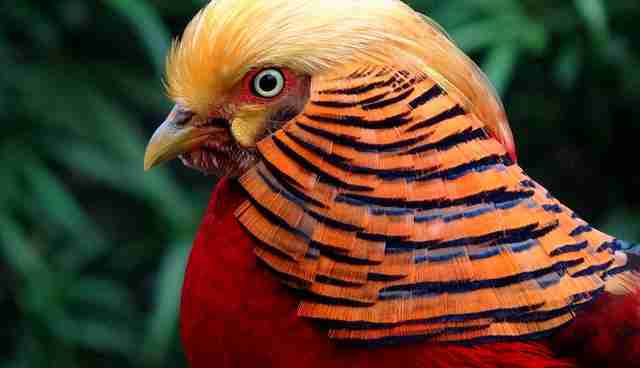 Turns out, nature has blessed (or something) Little Red's feathered kind with what is strikingly akin to a Donald Trump 'do. It just took an election for folks to realize the similarity. "I had not noticed the likeness in the past because I had not paid particular attention to the pheasant's hairstyle," the bird's keeper told the Daily Mail. "But after Trump was elected President of America, I start seeing more pictures of him and I think the pheasant looks a little bit like him." Because of that, this bird has since gone viral. There's never a bad reason to stop and appreciate such a beautiful bird.